Over 2,800 persons have signed the online petition to the President and Prime Minister of Sri Lanka urging immediate action to be taken to undo the blatant injustice suffered by Michael Anthony Fernando. 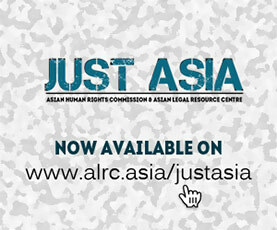 The Asian Legal Resource Centre made an oral submission at the 59th Session of the UN Human Rights Commission on the 9th April, 2003, regarding the case of Michael Anthony Fernando. This statement is available at www.ahrchk.net. Michael Anthony Fernando (Tony) is a petitioner in a fundamental rights application and was sentenced to one year’s imprisonment without trial and was later tortured in prison. This blatant injustice has caused outrage and serious disappointment with the justice system in Sri Lanka. A further fundamental rights application has been filed against the torture of Tony and a revised application on the contempt of court case is being prepared. However, Tony is still being chained to a hospital bed. He is suffering, and his physical and mental condition is serious. We urge you to join the online petition and to encourage others to do so. Those who have no access to the internet can send their names by email to ua@ahrchk.org or rghr@ahrchk.org. Their names will then be entered on the online list. For further information on this case kindly refer to former issues, or see the original urgent appeal on this case. You can see the online petition at http://www.ahrchk.net/modules.php?name=AHRC_Petition_Srilanka. further information or to make requests for further appeals.